Trulieve has demonstrated strong operational efficiencies in the State of Florida. The State of Florida will be more competitive moving forward as large Multi-State Operators Build Out. Investors will want to pay attention to Trulieve's out of state operations to determine the long run attractiveness of the common stock. 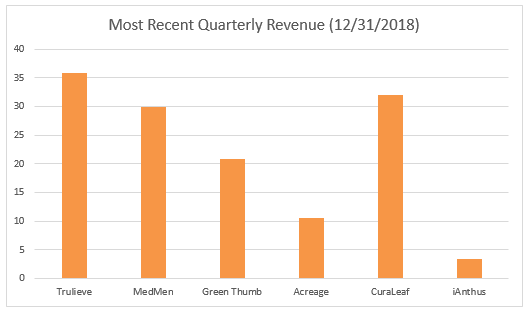 Last week, Trulieve put out their annual financials, and I thought it would be a fun exercise to write my analysis to share with that cannabis investing community. In CY2018, Trulieve managed to accomplish something that very few in the space have, profitability. The line items that jumped out at me were "Fair Value Adjustments on Inventory Sold" and "Fair Value Adjustments on Growth of Biological Assets." 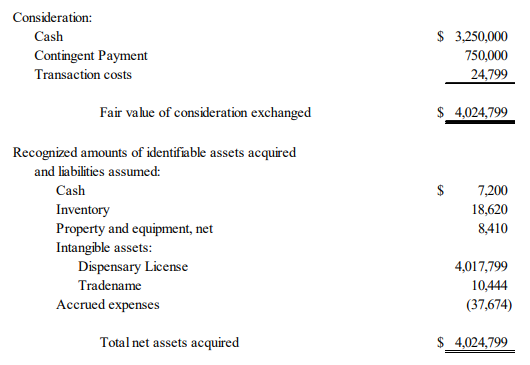 This is one of the nuances of Cannabis Accounting, which makes gross margins a little difficult to understand at this stage. Effectively, companies recognize finished products as revenue (prior to sale) and make adjustments afterwards based on the actual selling price of the products against the assumed price when the revenue was initially recognized. They come up with these numbers based on an estimated selling price. Which in this case, Trulieve is estimating an average selling price of $9.93 down from $11.06. This mostly due to an accounting change, where they switched from accounting for cannabis in active grams of extract (CYQ3) vs. grams of flower (CYQ4). For example, in the CYQ3 filings Trulieve states their cost per gram at $87.40 per active gram. Overall, it is hard not to like the numbers they are generating relative to almost anyone in the space. 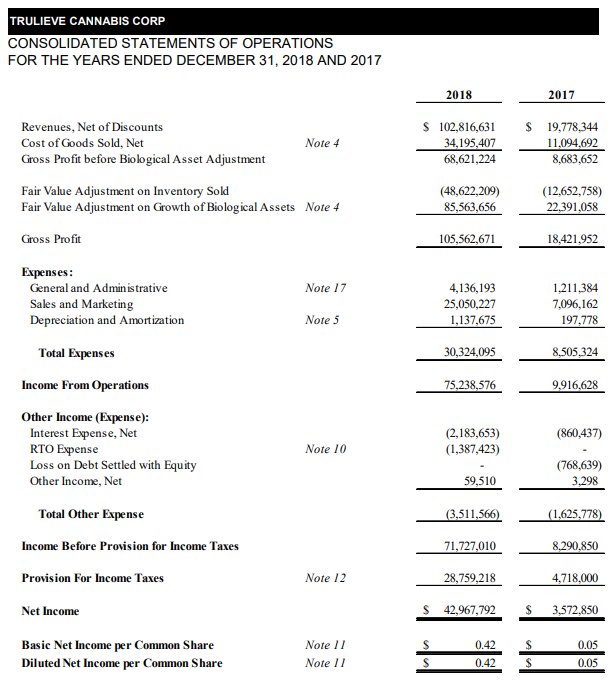 The company generated a gross margin before and after the biological asset adjustments of 66.7% and 102.6%; I told you these accounting rules make things a little fuzzy! If there is one thing that should be highlighted in the above, it's that Trulieve does not have the same footprint as other MSOs, and are only operating in states (mostly Florida) where they are allowed to consolidate all their revenue. Also, most of the above companies are much more aggressive with M&A and have greater revenue generating power from acquisitions in the queue. For example, in MedMen’s case, last quarter they filed US$29.9MM revenue, and stated in a news release, with pending acquisitions the system wide number would be US$49.5MM in quarterly revenue. Trulieve is in a different class compared to all other MSOs when it comes to operating cash flow. If we use the same sample of MSOs from above, discarding Green Thumb Industries and Acreage, due to each of them only releasing partial information to date, we can see a major difference. 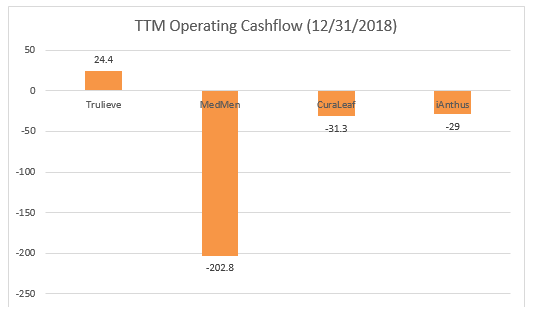 Trulieve is the only MSO producing positive operating cash flow and the other operators are not even close to being operating cash flow positive. In the company conference call, CEO Kim Rivers stated Trulieve has approximately a 62% share of the Florida cannabis market (medical). This is in large part because Trulieve was the first to market in the state and rolled out fast. There are two ways of looking at this. Either Trulieve is a leader in what will likely end up the second largest cannabis market in the US, or their operational inefficiencies will begin to glare as large competitors begin to scale out. It is also important to note that Trulieve has one other important distinction from all competitors in Florida. 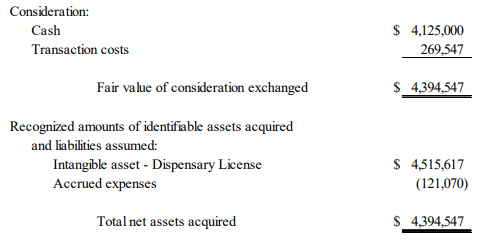 A settlement from April 2019, based on Trulieve making their early roll-out decisions on the premise their would be no cap, has put them in a position where they now have an additional 14 dispensaries on top of the capped number of 35. An excellent article by Seeking Alpha contributor Jonathan Cooper, highlights the details of the ordeal. To date Trulieve has made two acquisitions outside of the State of Florida. Leef Industries, a California operator. A shareholder who owned a significant number of Trulieve shares, and frequented the Palm Springs area, could not believe the purchase of Leef Industries so he sent a person to investigate. That person reported Leef Industries is located in a strip shopping center with limited parking. Like other establishments in Palm Springs the dispensary becomes shaded about 2:30 PM when the sun sets behind the mountains. Such a sunset would be advantageous in June, July and August when temperatures are generally in the triple digits. Leef Industries in the past, however, has not had to worry about its utility bills, since a staff member said it normally closes during the summer months when business disappears along with customers. All MSOs are built differently, but Trulieve is truly unique. They are the only company generating positive operating cash flow, they are amongst the leaders in revenue, and one could argue they have multiple accretive acquisitions still to make in other states. That being said, their early acquisitions have disappointed most investors who were expecting bigger splashes given the companies operating position in such a large state. Based on Q4, Trulieve is running at a $60M EBITDA run rate, putting them at a current valuation of less than 24x EV/EBITDA. In many ways, this makes them an anomaly not for just MSOs, but for the entire cannabis sector. They still have room to grow out in Florida, are cash flow positive with little long term debt, and have plenty of runway across the US. I would argue if investors are watching Trulieve from the sidelines they want to focus on the company’s execution outside of Florida, and monitor how the company defends itself within the state. If Trulieve truly has an operational advantage it will certainly appear in other states as they roll out in the upcoming quarters.